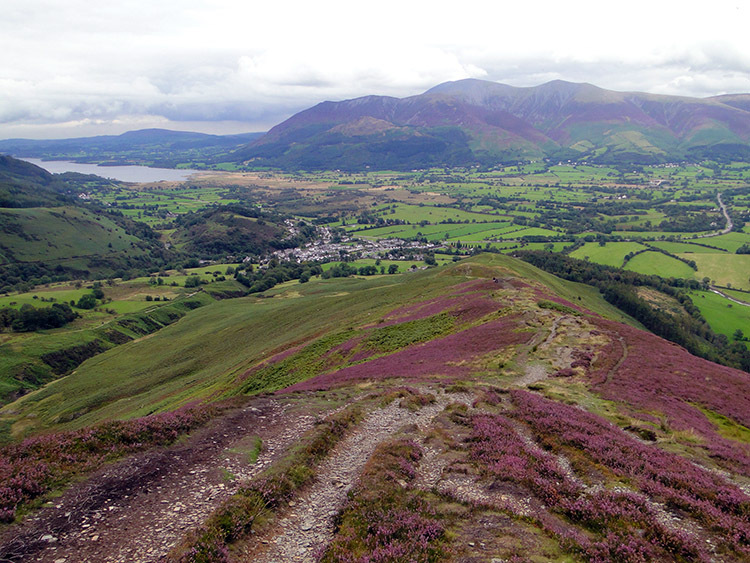 Summary: A lovely and one of the shorter Wainwright Fells walks. 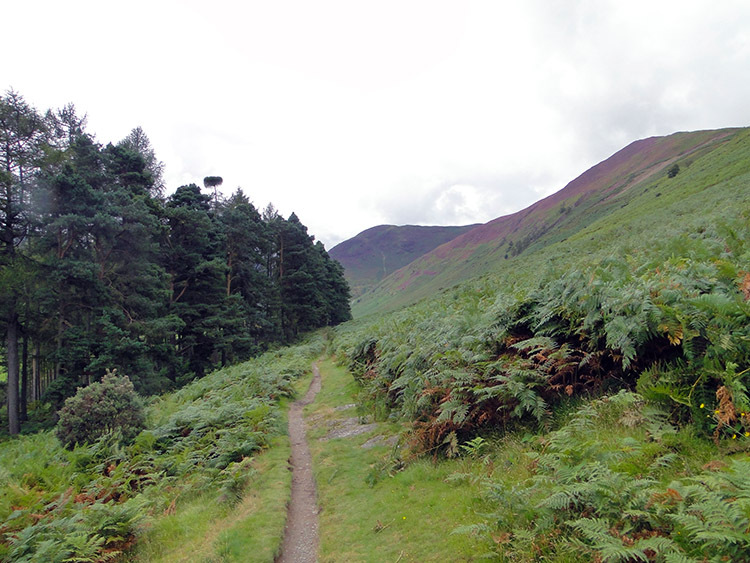 It is adorned with splendid views of Newlands soon after the start and during the steep climb of Causey Pike which gives you an excuse to take your time on the ascent. In fact, all of this walk is in beautiful surroundings. The Walk: Three weeks and one day had passed since finishing my 1,120 mile walk of the British mainland at Lizard Point in Cornwall. Just over one week had elapsed since I had ventured out for a short walk on the edge of the Yorkshire Dales on Skipton Moor. I was aching for more before the summer began to give way to Autumn so on the last day of August I took a short break in the Lake District to bag a few Wainwrights. Completing them had now become a goal. Travelling over from Yorkshire had necessitated this first walk to be the shorter one of the mini break but that did not mean it couldn't be spectacular and by golly it was indeed spectacular. Despite morning sun during the car journey across northern England cloud accumulated the further west I got and when I arrived in the Lake District it lingered frustratingly over the fells. The weather remained bright though, there was no chance of rain and things were really set fair as I set off from the southern end of Braithwaite village and along the metalled track towards Braithwaite Lodge. At the lodge a National Park worker was digging out a new fence post for the gate giving access to the fells. I wished him a good day as I passed through the empty gap and onto lush green short cropped fell. Soon I came to a fork in the track; right would have taken me up Barrow but this was already decided as my route on my return so I forked left and tracked due south along a wood side toward Uzzicar. As I walked I revelled in thought at my recent accomplishment. I was in marvellous spirits and I wholeheartedly felt superb. I looked forward to the day immensely. As I walked along the woodland I was closed in from extensive views so looked to my right on the eastern flank of Barrow. It was covered in green, particularly in dense bracken which would make a tough foe to walk through. The bracken also fringed the track I was walking along, keeping me on the straight and true path cut out for the purpose of accessing the north western edge of Newlands, one of my favourite Lakeland Dales. 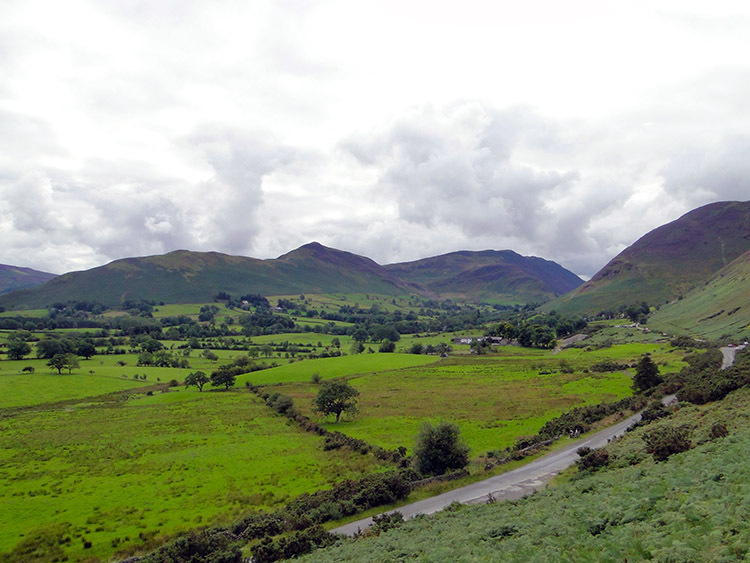 I reached the edge at Uzzicar and could not take my eyes off Newlands as I made my way along the quiet road to Stonecroft. Only the very occasional car distracted my attention and even they were slow, obviously in heed of walkers taking preference. As I walked and looked east I observed what seemed lines of ants climbing a small fell on the north east edge of the valley. 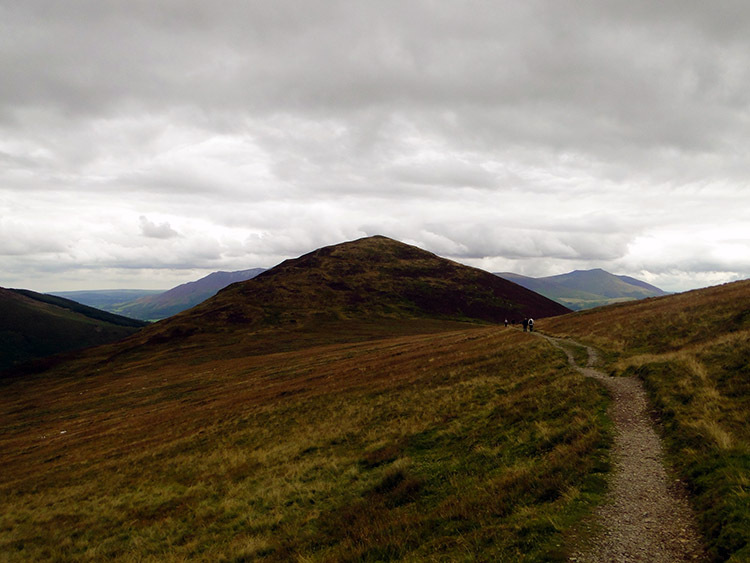 Of course it was people in their masses climbing Catbells from Hawse End via Skelgill Bank. 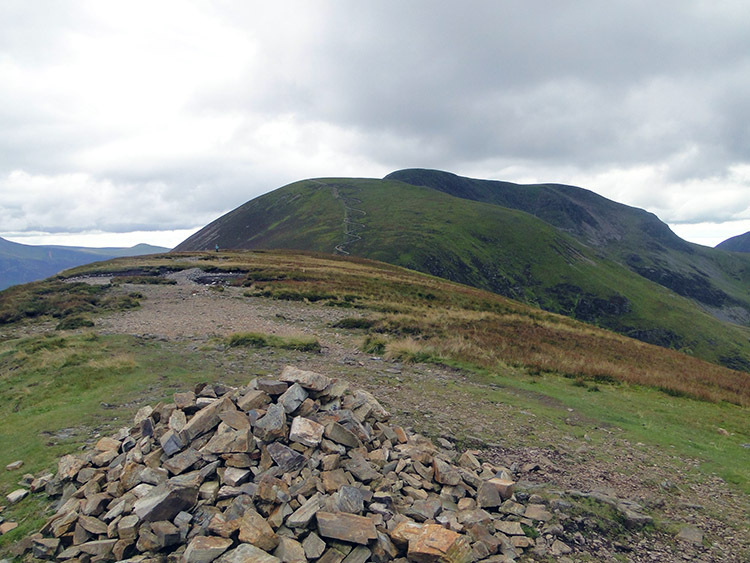 The one mile ascent of 1,000 feet is probably the most walked mile in Britain. 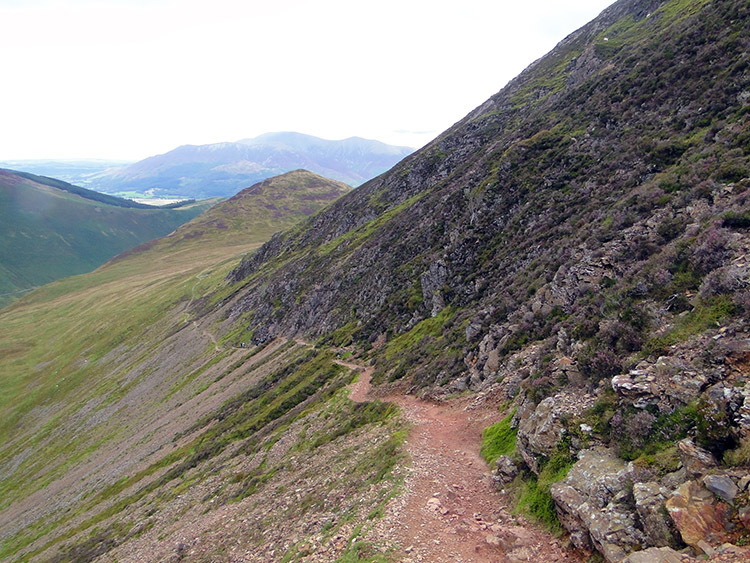 I was glad I was on a quieter path and began to ascend from Stonycroft to Rowling End enjoying my brilliant views. While not expecting to experience the crowds of Catbells I was surprised there were so few people on my walk, especially as Wainwright had said of my particular choice of route from Stonycroft as such: "Deservedly this is a popular climb, with a heavy summer traffic, the route being quite charming, the views superlative, the finish a bit of real mountaineering, and the summit a place of distinctive character". And wow, was he right. 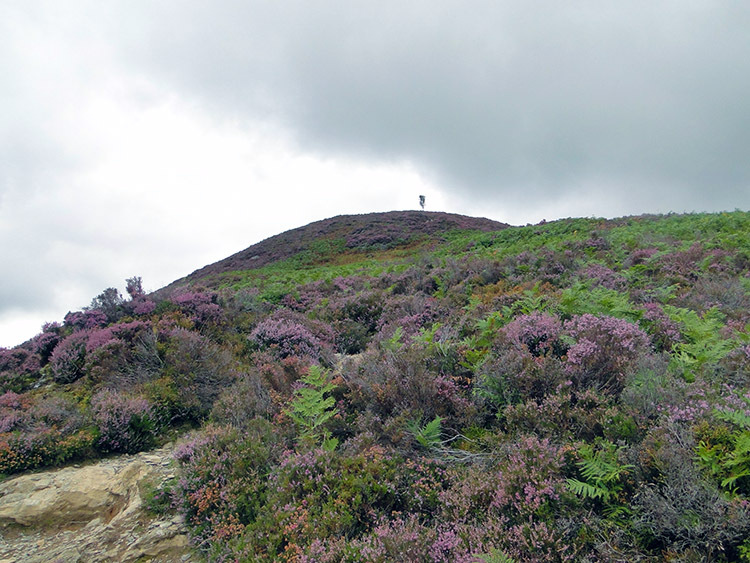 I was so lucky to be on this path and this climb at this particular time anyway because the heather was beginning to profuse in blossom. It was a stunning sight and got more incredibly beautiful as I climbed into the midst of it. The brilliant reds, mauves and pinks set against backdrops of white and grey stone and rocks and against the brilliant greens of bracken and grass were stunning. I was enthralled everywhere I looked and I did so glory in the joy of it all. Climbing the steep bank to Rowling End was easy in the surroundings for breaks to take breath were so time consuming in themselves with glory to see in every turn of the eye. As I reached the summit of Rowling End the brilliance of the scene around me improved more and if ever I could explain rapture to you then this is it. 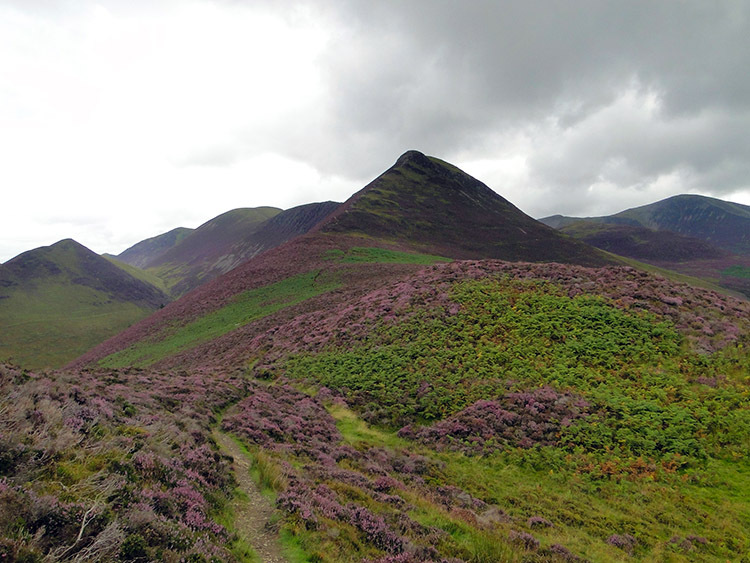 From Rowling End I could not only see the beautiful colours of the heather blossom, rich bracken and grasses, rock formations and outcrops and Lakeland flowers but now I could see the full splendour of Newlands with Dale Head, Hindscarth and Robinson dominating the southern end of the valley. I could also see the massif of Skiddaw and more mountains appearing in the distance. 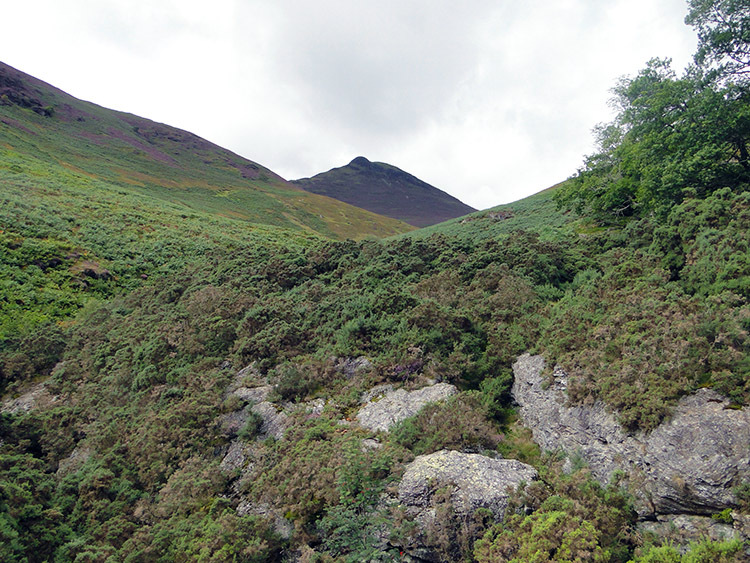 Finally I could once again see the cone of Causey Pike which had been shielded from my sight on my climb of Rowling End and by gathering myself from my gob-smacked awe I tore myself away from Rowling End and onward toward my first Wainwright of the day. 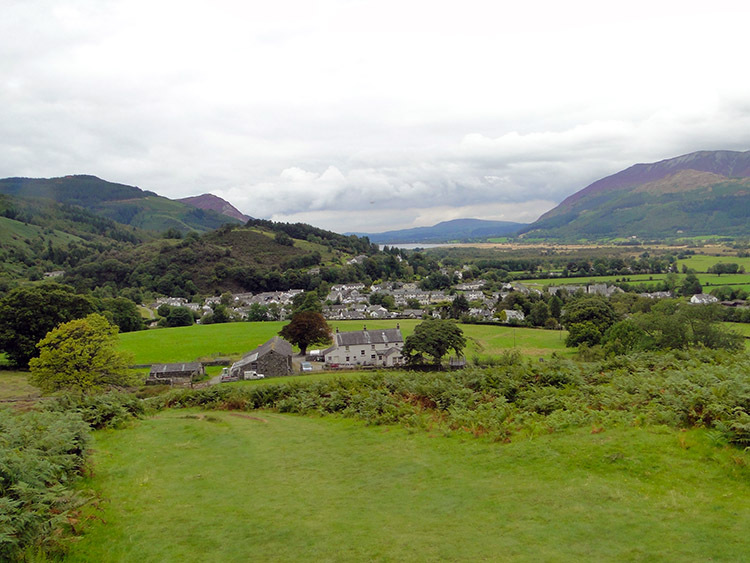 "Predominantly the view is of mountains, but the severity and starkness of their outlines is softened by the verdant loveliness of the Vales of Keswick and Newlands. 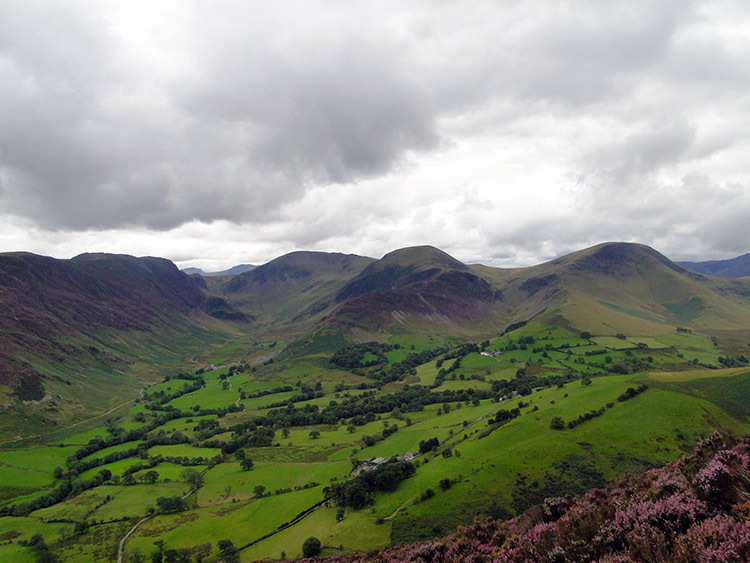 The head of Newlands, displaying the great humps of Dale Head, Hindscarth and Robinson - a magnificent grouping - is exceptionally well seen. The several pikes of Scafell appear from this viewpoint as separate mountains". I read this passage of Wainwrights after I had personally written about Dale Head, Hindscarth and Robinson myself. I feel awestruck I made such similar comment on the terrain seen from Causey Pike but then anyone up here on a clear day could not fail to capture likewise emotion. The view is incredible as the panorama photograph above shows. 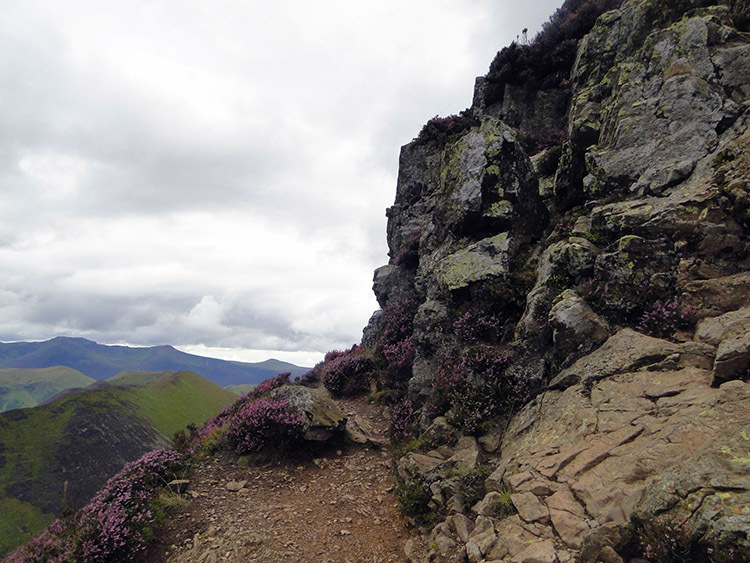 Once I reached Scar Crags I descended from the high ridge to follow a track down to High Moss, a track I had taken a couple of years before in the opposite direction on an ascent to Sail while on the Coledale Horseshoe walk. As I dropped lower I took a short break for refreshments near High Moss before making tracks towards Outerside which was to be my third Wainwright of the day. Awestruck with the magical beauty I had experienced so far I trudged up the south west flank of Outerside. Now a little tired but with the 1,000 mile walk endurance still in me I walked up to the summit of Outerside without a break before sitting on the summit stones to take in the view. 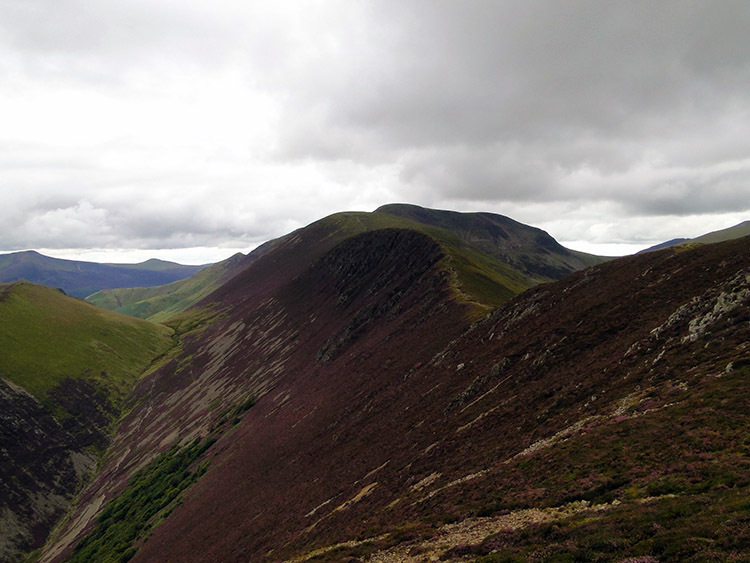 Admittedly it is poor compared to that experienced in Causey Pike and Scar Crags with higher fells closing it in and only local interest prevailing. 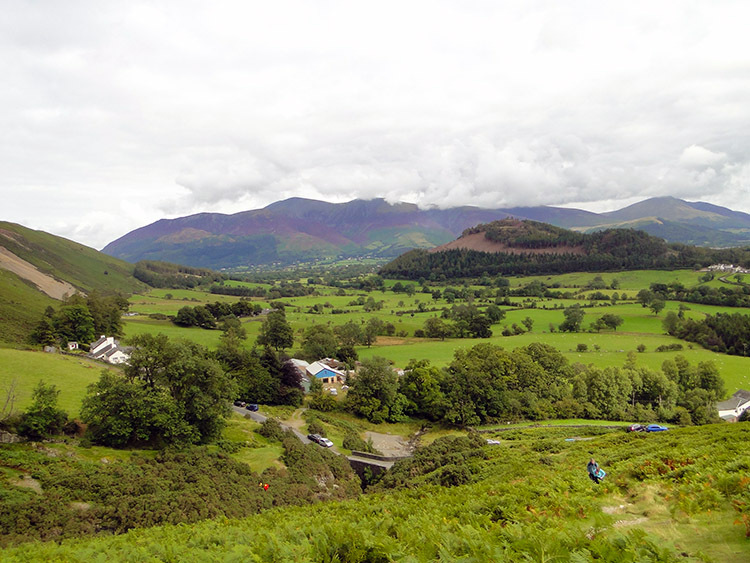 For that local interest then look to the north and west to Grisedale Pike for it is an imposing giant as seen from the modest height of Outerside. Apologies to Outerside made, I walked off the small Wainwright and on lovely heather fringed tracks to Barrow Door before making the short ascent to Barrow, my fourth and last Wainwright on this gem of a Lakeland walk and when I reached the top of Barrow I got another unexpected delightful wow moment. 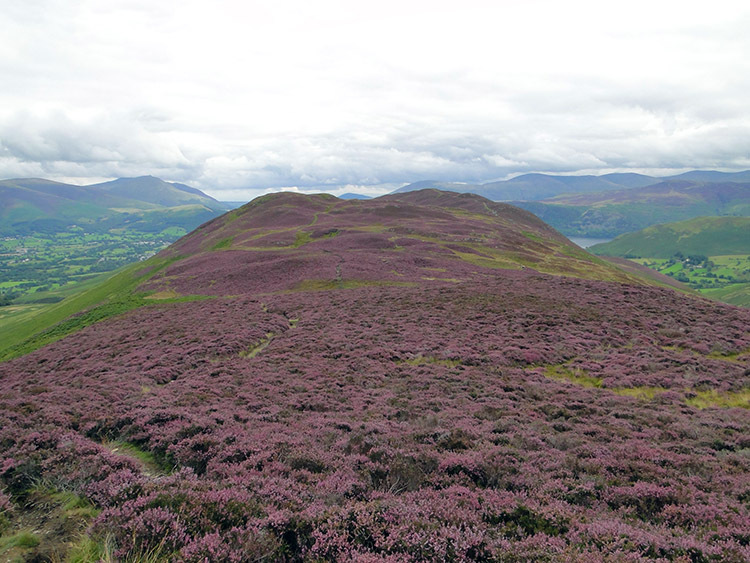 Looking directly towards Braithwaite from the summit the hill was covered in full heather blossom, a complete carpet of colour in the whaleback shape of the north aside of thew hill. It was an incredible sight. I had to get off the fells now, my cup of enjoyment was so full I could take no more and I struggled to cope with the beautiful views that accompanied my descent to Braithwaite, views of Skiddaw and its satellites, of Bassenthwaite Lake and further north through the gap to the 190th highest Wainwright and one of his favourites that is Binsey. I was overjoyed, enraptured by the walk. 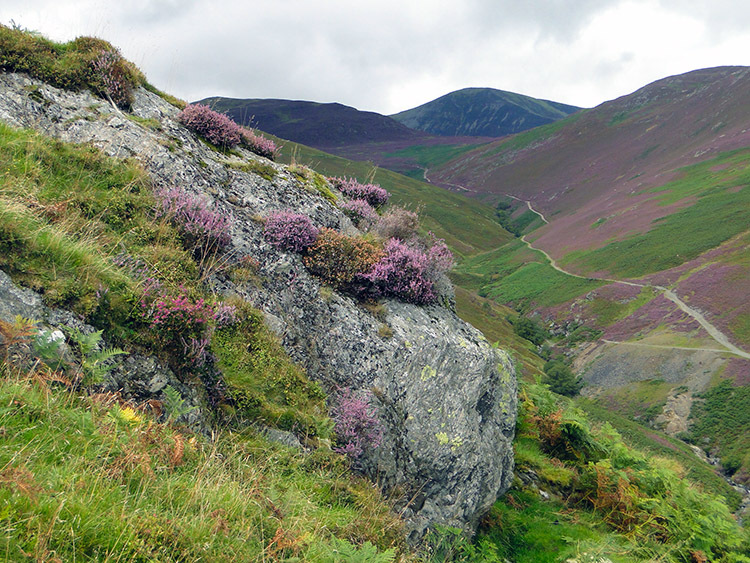 It was a thrill, it was a delight, it had practically everything one could wish for on a walk so short with an entrance into a remarkable valley, a steep climb, exquisite views throughout, rocky edges, a scramble, a lovely ridge walk and then there was the heather. One to do when the heather is in blossom. No doubt.